NCAA Basketball Open Practice Schedules for Today! Hello there gang! Jerm here with a quick update for all of you college basketball fans! 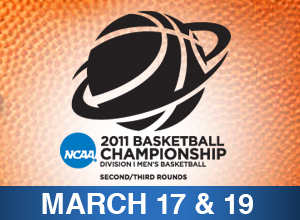 We&apos;re counting down to the tip-off for some high flying NCAA college basketball here in the Tampa Bay area this week! This Thursday the 2nd and 3rd Rounds of the NCAA Men&apos;s Basketball tournament will get going at the St Pete Times Forum, as teams fight their way to the coveted Championship trophy! The teams arrived yesterday, will be holding practices throughout the day today before game times start on Thursday! Well folks that&apos;s all I got for now, but be sure to check back with us as we draw closer to the event for more updates on NCAA related things to do in Tampa Bay and Tampa Bay sports updates!